AS pointed out two months ago, Microsoft had hooked up with NASA to make some pseudo-open source project that denies access by open source platforms. How ironic is that? Microsoft did something similar with the Library of Congress [1, 2, 3, 4, 5, 6, 7, 8, 9, 10, 11], denying public access to information owned by this very same public, unless they buy from Microsoft. And guess what? Microsoft paid (as usual) the Library of Congress millions of dollars to achieve this. It is truly appalling, but to expect the same from NASA given its track record (see [1-15] at the bottom) is not easy. 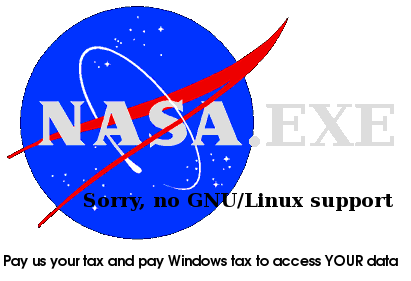 NASA continues to shut GNU/Linux users out because of Microsoft. It’s not the first such example (World Wind comes to mind). WorldWide Telescope was initially available only as a Windows program, but the company has since released a preview of a WorldWide Telescope Web client for Intel-based Macs, using Microsoft’s Silverlight technology. As expected all along, Microsoft is now using MSODF [1, 2, 3, 4, 5, 6, 7] to do the same thing with document formats, pretending that it supports standards while at the same time violating them. Here is an essay from yesterday that touches on the subject. Microsoft office is being dragged, kicking and screaming, into an open office space of file formats. Of course they are not doing it without a fight and trying to impose their own standards. Yet while they have the majority of market share they have a minority of choice. The increase in choice brought about by open source software is steadily eating away at the Microsoft cream pie. To aid in software development, NASA created CoLab, a blend of virtual and physical coworking environments. Since community members are spread out all over the globe, a lot of collaboration activity takes place on a private island in Second Life, a virtual world built around an open source framework. NASA even has its own OSI-approved software license, the NASA Open Source Agreement, to apply to software created for the agency. NASA’s Ames Research Center recently developed a bug tracker written with open source Bugzilla tools. The Problem Reporting Analysis and Corrective Action (PRACA) system provides a single trouble ticket database that’s available to everyone involved in the Shuttle program, clearly a better solution than the 40 different databases it has amassed over the last 30 years. NASA’s MMO Video Game To Have A Linux Port? This game is still a ways from being released, but at the heart of this game is the Unreal Engine 3 — the same engine that powers Unreal Tournament 3, America’s Army 3, and dozens of other titles. Unreal Engine 3 is a multi-platform engine that has an OpenGL renderer and is compatible with Mac OS X and Linux even though we haven’t seen any titles be released yet for Linux. version that adds a large number of major improvements. The software, called the Problem Reporting Analysis and Corrective Action (PRACA) system, was created by the Human-Computer Interaction Group at NASA’s Ames Research Center, and is designed to give a wide cross-section of people in the Space Shuttle ecosystem access to a single database package for tracking problems with the Shuttle and its associated infrastructure. The primary Open Source package used was Bugzilla, from the Mozilla Foundation. According to Vera, not only is the new system much less expensive and more streamlined than the software it replaces, it is also much easier to maintain. Rather than having to submit desired changes to the developers of proprietary problem tracking systems and wait for the revisions to be returned, NASA developers can make changes to PRACA on their own, often on the fly. NASA’s Center for Computational Sciences is nearly tripling the performance of a supercomputer it uses to simulate Earth’s climate and weather, and our planet’s relationship with the Sun. Maybe they should run Mac or Linux. Then they would have nothing to worry about at all, right? Malware has managed to get off the planet and onto the International Space Station (ISS), NASA confirmed today. And it’s not the first time that a worm or virus has stowed away on a trip into orbit. Internet Archive, founded in 1996 to create an Internet-based library, will manage and host NASA’s new interactive image gallery on the cluster of 2,000 Linux servers at its San Francisco headquarters, said John Hornstein, director of the NASA images project for the group. The non-profit currently runs 2 petabytes of storage, Hornstein said. NASA’s Goddard Space Flight Center in Greenbelt, Md., has established a Web site for open-source projects that were developed by center personnel for mission needs. By releasing such code into open source, NASA hopes to speed development of the software, as well as raise awareness of NASA research. There has been a long standing rumor regarding NASA running Fedora which all of us in the Fedora community have been always intrigued by. Is it true? What are they doing with it there? Why don’t they run RHEL. Fortunately enough, a couple of weeks ago, I got to experience NASA behind the scenes, first hand, and hang out with the coolest members of the Fedora community, and find out the answer to these questions and lots more. On the software side, embedded Linux vendor Wind River says it was selected to “support the development of NASA’s New Millennium Program Space Technology 8 (ST8) Dependable Multiprocessor.” As part of its role in supporting the project, the company will supply its Platform for Network Equipment, Linux Edition (PNE-LE) for use on the DM system. Space agency among the growing list of federal agencies that have put a temporary hold on Windows Vista rollouts. A Linux-based NASA lunar rover is on maneuvers — and Internet webcams — this week in the Arizona desert near Meteor Crater.